Restaurants et boutiques: Il y a d'innombrables restaurants, épiceries et boutiques de souvenirs / cadeaux dans un rayon de 1 à 3 miles de Indian Creek. Juste 1 mile sur la route sur Formosa Gardens Blvd. à l'autoroute 192, vous trouverez un restaurant Outback Steak House, Red Lobster, le restaurant Giordano's Chicago Pizza, le Grill italien Carabba, le Cracker Barrel, le TGI Friday's, le Taste of China, le Golden Corral, le Waffle House, le Subway, le Taco Bell, le McDonald's, Winn-Dixie Food Store et Walgreens. Un autre mile plus loin, il ya Olive Garden, Denny, Shoney, Ponderosa Steak House, Sizzler, Publix Supermarket et bien plus encore. Un Super Target est à 3 miles et Super Walmart à 5 miles. Tous les conforts de la maison: 2 chambres principales avec salle de bains une avec un lit King size et l'autre avec une reine. Deux maîtres ont 22 ’’ LCD chacun. Les deux autres chambres disposent chacune de 2 lits jumeaux avec salle de bain complète commune. La disposition de niveau plat est pratique pour les 55 ans et plus et les familles avec de jeunes enfants. Complet avec une cuisine entièrement équipée et beaucoup d'espace pour vous et vos invités, vous pouvez vous détendre et passer vos vacances à vous détendre de votre emploi du temps normalement occupé. Avec un mobilier confortable et luxueux, des serviettes et du linge de maison fournis et la climatisation centrale, vous n’avez pas à vous soucier des détails. La piscine et le spa exposés au sud-est bénéficient d'un ensoleillement maximum en Floride et d'un coucher de soleil paisible avant la nuit. La piscine et le spa peuvent être chauffés en option. Le Lanai est entièrement blindé pour garder les insectes tout en permettant au soleil d'entrer. La terrasse de la piscine est équipée de chaises longues rembourrées, de tables et d'autres meubles de piscine. Indian Creek Caractéristiques: Indian Creek a de nombreuses attractions sur la propriété pour les invités et toute la famille. Les enfants adoreront l'un des 2 terrains de jeux dotés de barres d'escalade, de toboggans, de balançoires et d'équipements. Il y a des courts de tennis, des parcs herbeux, un terrain de football et un putting green. Vous pouvez faire une promenade autour de la communauté, du sentier de la nature ou simplement profiter de tous les espaces ouverts. Pour les coureurs, il y a une piste de jogging à travers le pont qui contourne les deux lagons à proximité, à Indian Creek. Golf: Il y a plusieurs terrains de golf de championnat à quelques kilomètres de notre maison (à seulement cinq minutes de Mystic Dunes, Reunion et Champions Gate). Le parcours de golf de la Réunion compte 36 trous et a été conçu par Jack Nicholas, Tom Watson et Arnold Palmer. Ce cours a fait la liste des meilleures semaines de golf parmi les 40 meilleurs nouveaux terrains de golf du pays. Vous pourrez profiter du parcours de golf Lake Buena Vista, du parcours de golf Orange Lake Country Club et du parcours de golf Osprey Ridge sur le parc Disney. * Les autres caractéristiques comprennent: Canapés en cuir de luxe avec lit, Internet sans fil gratuit Salut-Speed ​​- Maison Téléphones avec gratuit illimité Appels Nationwide, plus de 200 chaînes câble gratuite, télévision à écran plat, CRIB / chaise-haute / Stoller / sèche-cheveux à disposition, d'abord le sida . Remarque: jeux de Grill disponibles à la location. * La cuisine a une superficie de manger dans et il ya une salle à manger formelle. Cette maison a une laveuse et une sécheuse pour les clients. * Société de gestion locale est disponible 24 heures, 7 jours pour des problèmes ou si quelque chose ne convient pas. * Ménage est disponible Si la demande de l'invité il. L'invité paierait directement la femme de ménage. This is a very nice home and owner is quick to respond to all request and inquires. The house was clean upon arrival with the exception of the grass area's outside. The home in general needs some TLC as baseboards look dirty, piles of dead bugs on window sill in kitchen, walls marked up, several screens on lanai are either missing or flapping in the wind, all rugs look dirty and worn, carpet was a little seedy. Took a few day's to get spa fixed, never got light in pool fixed. Limited great room furniture and not very comfy. Overall it kind of reminded me of a cheaper hotel. It was in a nice quiet neighborhood, good for walking. Pool was nice since we paid for heating. Spa once working was great. Plenty of kitchen plates and utensils, beds were comfortable. Everything you could possibly need is close by. Would stay here again if it had a good going over. This house is one of the best vacation home we have stayed. Spacious and very clean, very comfortable beds, new sofa, nice decoration, fully stocked kitchen, great game room, big pool, safe community and convenient location to shopping and theme parks. it also provides all baby stuff, high chair and real crib. I knew that pool heat time depends on outside temp and size of pool because I had one home in the other place and also visited Disney for several times. We only ordered spa after checking weather and we had good time. Home owner and local manager are really helpful and patient to explain any question. Really love it and would like visit again. Terrible STAY AWAY this is not a Castle!!!! We were very excited to be spending vacation and the holidays in Florida. I should have taken the other reviews more seriously. The home is very out of date. Every wall in the house had paint missing. Many of the walls had holes. All base boards were very dirty. ALL window seals were dirty. The pool looked dirty, not sure if it was old paint because it didn’t move, wouldn’t matter because we paid the extra to heat and the POOL NEVER HEATED UP. Spoke with the owner who said talk to the manager who promised me a refund, now the owner refuses to refund. We never got to use the swimming pool because the water stayed cooled. Do yourself a favor and pay more and stay somewhere else. This was our 7th VRBO rental and it’s was our biggest regret. Owner seemed easy to work with until it was time to refund. The internet device was sitting on the floor in the kitchen. The air hockey table was broken and appears to have been that way for a long time. Carpet was old and many of the rooms had bleach marks on it. We could only take one shower before you ran out. Oh yeah I do have pictures that is proof of EVERYTHING I have stated Only thing fixed during our stay was the outside security light that I had to call about. This house needs updates, this home is not a Castle!!!! I tried to resolve, but understand even if every dollar was refunded I would still leave the same review. Thank you for your stay. Our mission is to make every stay as close to perfection as possible ensuring our guests with the most relaxing experience. I fully understand guest started complaining everything if one thing is not satisfied. The pool heater can not be run 24 hours as you requested. That is the house rules communicated to you prior to your arrival. It is the rules as all other vacation homes to avoid broking pool heater due to long run. We also do NOT refund when pool heater works and keep running. During your stay, I only got two reports for the outside security light(fixed immediately) and pool heat(no issue) in the second day of your arrival. Local manager stopped by and checked immediately after you reported. POOL HEATER WORKS WELL and HAS NO ISSUE. My local manager explained it to you face to face and you also agreed it. Nobody talked anything about refund because pool heater works. If you did not want to use pool, then we can turn off heater but you did not ask for it. The first few days the outside temp is very cold so it takes longer time for pool to get heated. The next few days the temp is warmer and I did not get any other call/email/complaints from you anymore. Local manager keep monitoring the pool heater and it worked well. As I communicated, we would NOT refund because pool heater has no issue and keep running during your stay. If you did not want to use the pool, then during the stay you shall have let me know to turn off the heater instead of suddenly started asking for refund just one hour after checked out(usage was done). All was as site expressed. When we got there it was very hot as the air was not working, we called and it was taken care of immediately. The place was clean and we will definately be back. The hot tub never got hot and we didn't say anything because we would have only used it one night, but would have been great for our tired bones. Thank you so much for your lovely house!!!! I am glad that you love the house. Spa heating is optional and extra pay. You do not choose it so hot tube is not turned on. Looking forward for your next stay. Ants all over the counters, toilet kept running, beds were squeaky and uncomfortable. Pool alarm went off at random, scared my young children. Hard to reach mgmt. Overall felt poorly managed, needs updates. The size of the pool and the living room area were the only highlights. Close to disney attractions. But by day 2 of no responses or untimely responses I was ready to go. Never again. We are appreciate of your stay. There is no alarm in the house. Not sure what happened during your stay(never heard it before). After getting your call, local management company immediately stopped by and made sure old alarm system was plugged out completely. Owner and local management company keep responding immediately per request from guest. My family and I enjoyed stay here but did have a couple issues. One of the main issue was that the spa didn't work properly, when turning it on the water would drain out of the spa, the jets did turn on but would still drain. I did call the property manager but do to it being late Saturday afternoon could get no one out to look at it. Was hoping to have it fix on Monday but no one came out to fix it was very disappointed in this. Another issue was ants, I did as the information book told me to do and left no food out on the counter or anywhere but still had ants crawling all over the window and counter. Had to go buy ant spray to kill them. Those were my only problems, my stay was great, beautiful home and great location closer to Disney. Lots of shopping and restaurants close by to enjoy and wonderful places to rent. Would recommend for families to stay here, had a nice little playground in the community for kids to play in. Thank you for opening your home Yan.. Receive our warmest greetings. First and foremost thank you for choosing Emma castle as host of your recent holidays and liking it. Our mission is to make every stay as close to perfection as possible ensuring our guests with the most relaxing experience and sorry for not be able to quickly fix temp spa issue due to weekend store closure. I also notified local management company to spray more any killer.Allow us to thank you for sharing your comments with us, as they will allow us continue to improve and provide a truly four stars service to all of our guests. Indian Creek est un domaine résidentiel qui comprend deux terrains de jeux pour enfants, des courts de tennis et un terrain de baseball ainsi qu'un petit putting green, tous gratuits pour les clients d'Indian Creek. À seulement 5 minutes en voiture de Disney et à 1,6 km d'une sélection de boutiques et de restaurants. 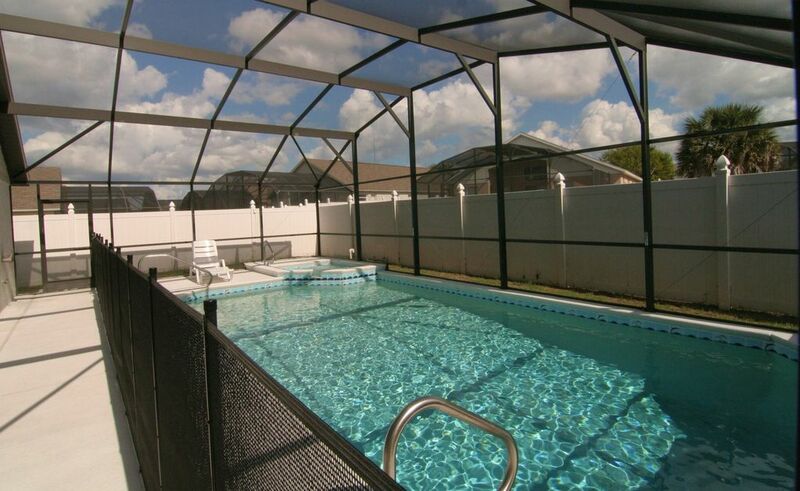 Pool heat: $150/week or $25/night (recommended between Oct-May). spa heat $15/night* Rates does not include 13.5% sales tax* $90 cleaning fee charged for stay less than 7 nights* BBQ Grill rental is available; please request a price quote.